I've been hitting Starbucks every Wednesday since I got a card for a free cup of coffee that's only good on Wednesday. Generally, I'm not a big fan of their coffee, which tastes burnt to me, but the free-brew deal is for a new blend that tastes like good, strong, non-burnt coffee. About a year and a half ago, I reviewed a book about the Starbucks brand which, at the time, was growing to encompass a lot of non-coffee stuff. I didn't quite get it and neither did the public, as the company's founding CEO is back in the saddle and his new agenda is to focus on... coffee. What a concept! The relentless Bob Lefsetz applied Starbucks' experience to the music biz... which Starbucks had tried to get into, releasing a lame album by Paul McCartney (which he just gave away in copies of a Sunday newspaper). I'm all for extending your reach, but jeez; Starbucks took a cup of coffee and turned it into an expensive, trendy, money-making business. Sometimes, just doing one thing — or one set of things — is enough. More than enough, in fact. 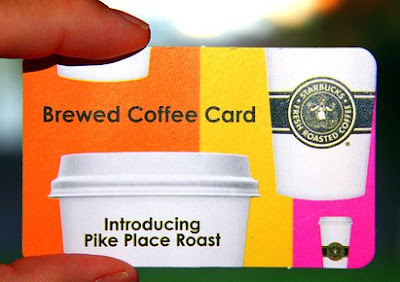 My free coffee card expires next week, incidentally. After that, we'll see.